Dryer roller ER349241 (349241) fits Whirlpool, Kenmore/Sears, Estate, Roper, KitchenAid and others. 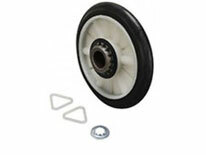 The drum rollers (2 per dryer) support the drum and function as a drum bearing. The rollers are located under the drum near the back. The drum becomes difficult to turn. When the resistance becomes to great the dryer may fail to start. Remove the drum and check by hand that the roller turns freely, but is not loose on the shaft. Bring your “drum roller” in for free confirmation that it is good/bad or call the U-FIX-IT store for free assistance with diagnosis.